The Spatial Communication and Contextual and Theoretical Studies Programme Group at London College of Communication invited me to present some of my projects, notably my thesis on Interior Practices in Urban Environments, to staff and students in the college campus. It was a unique opportunity to contribute to the programme events and provide an insight into perceptions and multi-sensory practices. 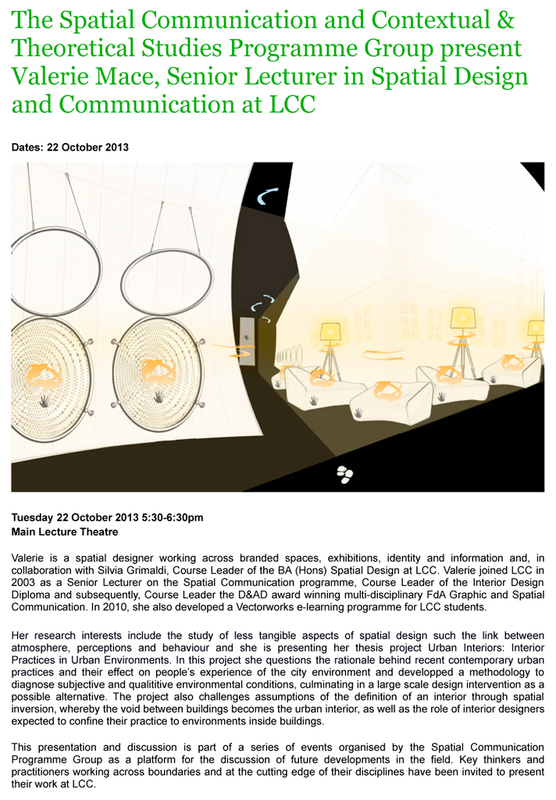 This entry was posted in Atmosphere, Perceptions, Spatial Experience and tagged atmosphere, London College of Communication, multi-sensory, perceptions, presentation, spatial. Bookmark the permalink.